A musical explosion of holiday entertainment fireworks will take place Wednesday and Thursday, July 3 and 4, at the Honolulu International Center Arena at 8:00 p.m. when the Andy Williams show takes the stage. Andy Williams, America’s No. One singing personality will bring not only his own considerable talents to Honolulu audiences for the first time in person, but will also present two other leading acts of the entertainment industry, Peter Nero and the Osmond Brothers. Andy Williams himself is something special. He is a mixture of sophistication and simplicity. His mellow baritone voice and infectious sense of rhythm appeal to both young and old. It is a phenomenon in show business today, but it comes from a long career in the public eye. In five short years, Andy Williams has a total of nine Gold Records won from individual album sales over $1,000,000. Today his albums sell at the rate of 25,000 each week. Andy has been singing since he was eight years old. He and three brothers climbed high on the show business success ladder until 1952 when they disbanded. Andy decided to do a single and the rest is history. His two week contract on Steve Allen’s “Tonight Show” stretched into three years. He did everything on the show from comedy sketches to an Apache war dance. In the summer of 1959, he starred in his own one-hour show, and became a TV regular during the next two summers. Not wanting to rush right away into a full weekly show he drew national acclaim for the many “specials” such as the hour-long color spectacular, “Andy Williams in Music from Shubert Alley,” in which he starred. 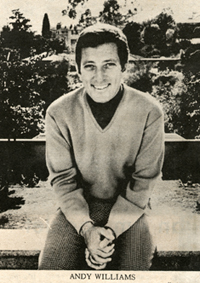 “The Andy Williams Show” debuted in 1962, winning an Emmy Award and two important Emmy nominations in that first year and in 1967, the show again won the coveted Emmy as television’s outstanding variety program. Peter Nero is a pianist with a style strictly his own and encompassing everything from pure jazz to an ingenious use of the classics. He has a gift for elaborating musical ideas which enables him to extract from the piano a range of emotion and expression rarely heard in “pop” concert. Peter is the possessor of a masterful technique which he uses to create a rainbow of emotion from warm pathos to delightful humor. Nero’s great artistry and a vibrant personality make him one of the most popular concert attractions in the world today. His popularity is attested to by his many appearances on top variety television shows, including the Ed Sullivan, Jackie Gleason, and Perry Como shows. Another high spot of the Andy Williams July 3 and 4 concerts will be the Osmond Brothers. It was during the first year of the Andy Williams television series that the Osmond Brothers act was born. Originally in 1961, there were just four brothers; Alan, 11, Wayne, 9, Merrill, 7, and Jay, 5. There are, however, nine children in the Osmond family and in natural progression, each youngster at his own behest, and with Father and Mother’s permission, has joined the act. From their beginnings as a barbershop quartet, they now sing, dance, act, and play numerous instruments both as soloists and as a group. The Osmond Brothers became an integral part of the Andy Williams TV family as the show progressed and their popularity increased. They have become a very popular attraction at home and abroad and recorded crowds of 20,000 during a concert tour of Sweden. They hold attendance records at state fairs throughout the country and have constant offers for many TV shows. Tickets for the two night concerts are on sale at the HIC Areana box office priced at $6.50, $5, $3.50 and $2.50.